In complete darkness (and freezing cold), I stumbled outside to collect my things off the line and bring them back into my bedroom where I did my best to hang what I could on my little dental floss line. My one and only pair of pants were still wet when I put them on the next morning, making my chilly walk to the bus stop more like a desperate attempt to not get pneumonia. That afternoon, after my last class, a fellow teacher came up to me and said she had tickets to a piano concert in Prague – would I like to come? I don’t own black slacks. I think we’ve been over this before…I have one pair of pants. So after meeting my friend for coffee, I found my way to one of the local shopping malls in Prague and began searching for something I could wear to a concert but also to school and church. I found some ¾ length pants which are kind of a thing here. They’re just a little big on me but they have sort of an Audrey Hepburn look and I thought to myself…When in Prague. (It’s Rome, I know. Artist license. Work with me, people). I have already sworn not to let my sisters see them ever, lest they ceremoniously cast my soul into the ring of Hades reserved for people who dress “just horribly” (I’m sure there’s a circle in Hell for that, right?). Unfortunately, I realized a little late that I didn’t have enough time to get all the way home to change and then back to Rodulfinum (one of the concert halls in Prague). Because I’m not a quitter, I gathered my newly purchased pants, paid 8 koruna to use the metro restroom, and changed in a stall. I didn’t look half bad either, except that I was still wearing my brown flats from teaching. Black and brown. There’s a fashion sin that would land me in that ring of fire for sure. New clothes have this magical ability to make one feel great about life and it was just the pump I needed to convince myself to spend a little money on food (since I also obviously wasn’t going to be home for dinner either). As if a part of me is actually still a college student, I gravitated towards the cheap sweets isle of a Lékárna (pharmacy) in the metro. Skittles do exist in Prague but they’re expensive and taste-wise I consider them the Mr. Hyde of the American Skittle (Dr. Jekyll, for those not following that analogy…). But I bought a bag, a small water and a “breakfast bar” that was something flaky and covered in chocolate that tasted a bit like a dead wheat thin. Upon exiting the metro with my purchases, I became aware of the torrential downpour that was sending people scurrying under buildings and popping umbrellas. I carry an umbrella with me everywhere now, so I pulled it out and started walking towards Rudolfinum. One Skittle at a time, I warmed up inside. One step at a time, I got colder and wetter outside. The streets emptied of humans rather quickly with the rainfall. I wandered from one lonely alley to another, keeping an eye on the church spires that crown the city in an attempt to keep my bearings. My friend had told me over coffee that afternoon that he doesn’t get lost in Prague anymore. I am still very good at getting lost and I do it frequently. But that day I didn’t mind. It was a good day to get lost. Every window was like a treasure box hiding antiques, books, crystals and chocolate displays. In one restaurant window I could see a young chef decorating small plates on a nicely set table with little butter towers. A waiter followed along behind him setting rolls at each place. I wondered what kind of party they were preparing for. I wondered what the bread tasted like. I wondered if the chef-boy was doing the butter display because he had been kicked out of the kitchen – shortest stick, perhaps? I felt a bit like Holly Golightly in my pants and flats with my polka-dot umbrella and my dinner of sweets, wafting from window to window, not minding anything – even the rain. 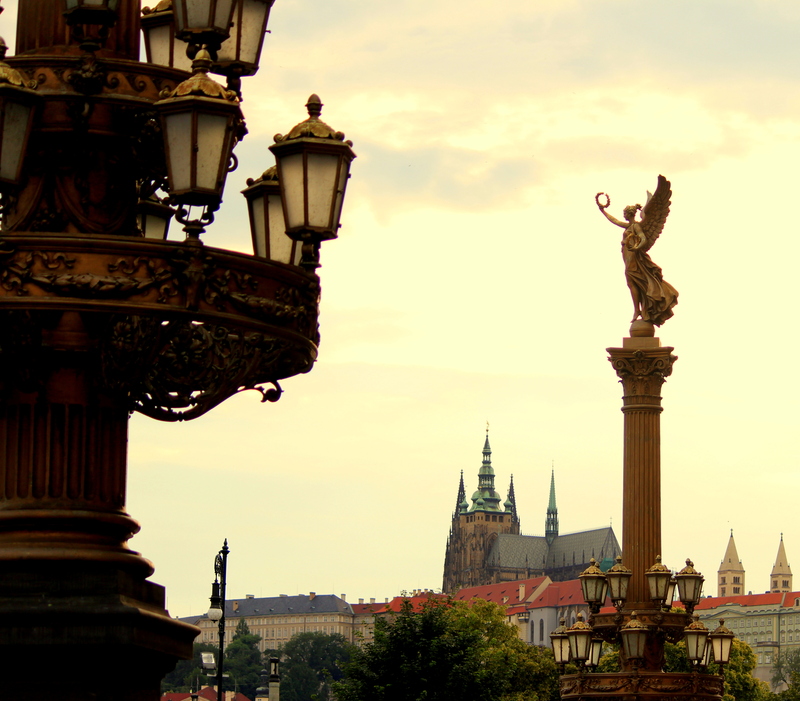 This entry was tagged Audrey Hepburn, Czech Republic, Prague, Rudolfinum, San Diego, travel, Travel and Tourism, weather. Bookmark the permalink. The camera is the smallest detail comparing to the smart eyes that comes behind. Nice job!